STRFSS is an inescapable consequence of our times. The body has its own mechanism of dealing with it - physical or psychological - to a certain degree, beyond which an individual has to depend on medication to keep it in check. Scientists looking for substances to relieve stress have now found encouraging results with Ayurvedic formulations. K K Srivastava and his team at the Delhi-based Defence Institute of Physiology and Allied Sciences (DIPAS) have found that Ayurvedic formulations can help soldiers survive extremely cold and stressful mountainous habitats. The scientists investigated the effect of the popular herb ginseng (Panax ginseng) and a formulation that Srivastava calls a composite Indian herbal preparation (CHIP), which is similar to Chawanprash, on 200 soldiers who stayed for 3-6 months at altitudes ranging from 3,000 to 6,000 metres. The scientists found that the deterioration of the soldiers' physical and mental faculties, such as perception and vigilance, was arrested with both ginseng and CHIP. On their return to the plains, the soldiers who had spent 3 months up in the mountains became normal faster than those who did not take the herbs. However, those who had stayed away longer, did not recover as well despite the administration of the Ayurvedic formulations, also called adaptogens. Srivastava believes that these studies show that some adaptogens could help soldiers combat extreme environmental conditions, and food supplements could enhance their performance there. Says Srivastava, "A goldmine of information exists in methodologies to prevent stress in ancient and medieval oriental medical systems." For instance, in Ayurveda, he elaborates, food supplements, herbs and minerals are known to increase physical endurance and mental performance. Stress, explains Srivastava, is the psycho-physiological response to a change in the internal or external environment. The ancients claimed that herbs and food supplements could increase an individual's tolerance to cold, heat, pain and disease and ever. Arrest the aging process. However experimental evidence to support these claims has been singularly absent. The results obtained by Srivastava and his team were based on a model that has been developed to test both the impact of different stresses on white rats and how various adaptogens can ameliorate these stresses. The DIPAS scientists restrained a rat in an overnight fasting state, causing anxiety and emotional stress and exposed the creature to low pressures and temperatures. The scientists then monitored the rat's physiological response to these conditions. They found that the rat's temperature fell to 231C. The rat was then placed in normal environmental conditions and allowed to recover till its temperature reached 37c and the rate and time it took to recover was monitored. 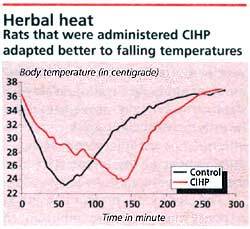 The scientists plotted the data on rats on graphs and said that the nature of these graphs are related to endurance and can be used as indices to monitor the effects of adaptogens on the rats. The scientists then repeated the procedure after administering various herbal preparations and combinations of herbs and minerals to rats, to evaluate their ability to deal with stress. They had mixed results. They found that some substances had a powerful effect on the rats whereas others, though acclaimed, had little effect. Srivastava and his team found that the so-called CHIP helped the rats acclimatise themselves to conditions which simulate high altitude regions, like lower atmospheric oxygen. The usual disruption of the delivery of oxygen to the tissues which occurs in such conditions was also arrested.